Teaching Philosophy: "My teaching philosophy is to keep student(s) engaged, connected and inspired. Encouraging them to explore there own possibilities, and the joy and empowerment of self discovery." 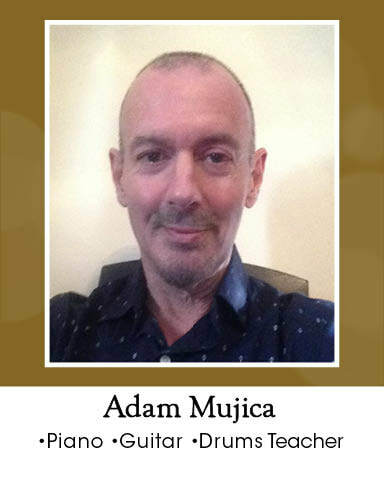 Adam Mujica was born in Boston, and studied at Berklee School of Music. He has recorded, performed, and toured in the U.S and Europe since 1978. Some of his most recent musical projects include playing drums and percussion for Rounder Records performing artist The Tarbox Ramblers as well as playing as accompanist for the Adaptive Dance Program with the Boston Ballet. Adam has spent the past 20 years devoting most of his time to teaching private lessons. He has taught at the Burbank Elementary School in Brockton and at the Guitar Center in Braintree. He has been teaching with Note-worthy Experiences since January 2019. Adam Mujica is so patient with my son and allows him his own creative moments so he learns in a way that is comfortable to him. We have been really happy with the lessons so far!